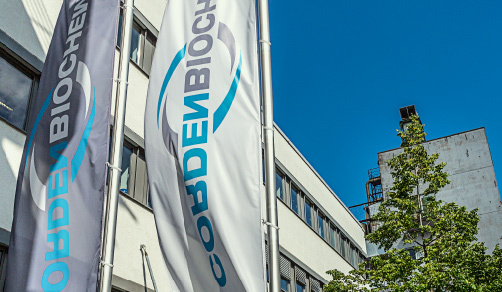 Corden BioChem, located in Hoechst near Frankfurt, Germany, is one of the world's largest industrial manufacturing partners, with a total fermentation reactor capacity of 3000m³ for biotechnology-derived product supply to the pharmaceutical and fine chemicals industries. Formerly a manufacturing facility of Sandoz (the generics business of Novartis), CordenBioChem are pioneers in applying green chemistry for intermediates and Active Pharmaceutical Ingredients (APIs), and are one of the largest custom manufacturers for fermentation processes in Europe. For sixty years they have implemented and optimized large-scale fermentation, downstream, biocatalysis and synthesis processes with world-class efficiency, quality and reliability. Being owned by ICIG, the Corden BioChem facility serves as a connection between the synthetic cGMP capabilities of CordenPharma and the non-GMP manufacture of chemicals in their sister company Weylchem.